County town of Herefordshire, England, situated on the River Wye, of some commercial importance in early times. When Richard I. returned from captivity, ten Jews of Hereford contributed £15 11s. 11d. to a "donum" made by the Jews of England at Northampton (1194). 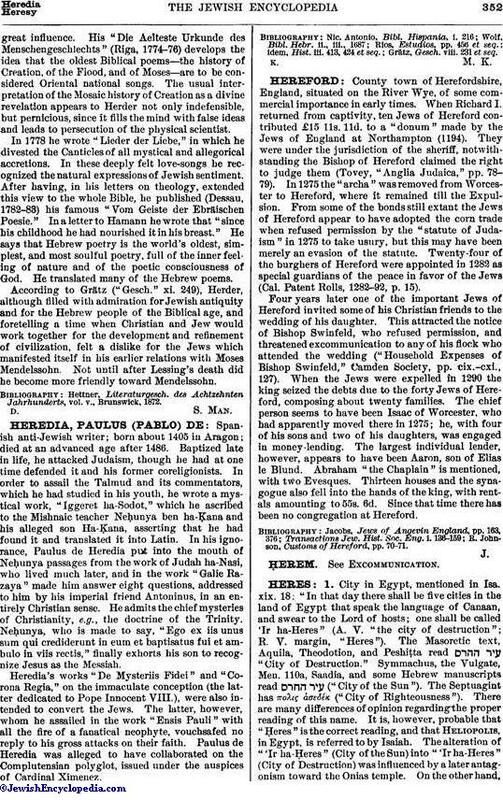 They were under the jurisdiction of the sheriff, notwithstanding the Bishop of Hereford claimed the right to judge them (Tovey, "Anglia Judaica," pp. 78-79). In 1275 the "archa" was removed from Worcester to Hereford, where it remained till the Expulsion. From some of the bonds still extant the Jews of Hereford appear to have adopted the corn trade when refused permission by the "statute of Judaism" in 1275 to take usury, but this may have been merely an evasion of the statute. Twenty-four of the burghers of Hereford were appointed in 1282 as special guardians of the peace in favor of the Jews (Cal. Patent Rolls, 1282-92, p. 15). Four years later one of the important Jews of Hereford invited some of his Christian friends to the wedding of his daughter. This attracted the notice of Bishop Swinfeld, who refused permission, and threatened excommunication to any of his flock who attended the wedding ("Household Expenses of Bishop Swinfeld," Camden Society, pp. cix.-cxi., 127). When the Jews were expelled in 1290 the king seized the debts due to the forty Jews of Hereford, composing about twenty families. The chief person seems to have been Isaac of Worcester, who had apparently moved there in 1275; he, with four of his sons and two of his daughters, was engaged in money-lending. The largest individual lender, however, appears to have been Aaron, son of Elias le Blund. Abraham "the Chaplain" is mentioned, with two Evesques. Thirteen houses and the synagogue also fell into the hands of the king, with rentals amounting to 55s. 6d. Since that time there has been no congregation at Hereford. R. Johnson, Customs of Hereford, pp. 70-71.